Well-designed and expertly executed early phase clinical trials can provide valuable information that may accelerate ‘go, no go’ decisions, potentially shortening the time of access to new, more efficacious treatments. While first-in-human studies had conventionally been performed in healthy volunteers, more recently there has been acceptance of the use of patients with the disease of interest. 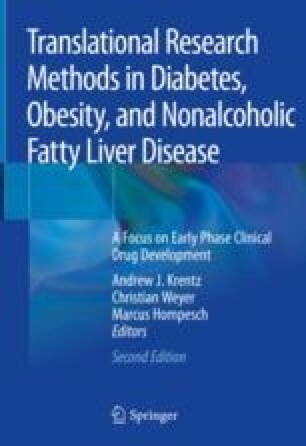 In the context of developing new drugs for the treatment of diabetes, obesity, and nonalcoholic steatohepatitis (NASH), this paradigm shift requires consideration of the risks, benefits, and practical challenges of studying patients with obesity, nonalcoholic fatty liver disease (NAFLD), glucose intolerance, type 1 diabetes, and type 2 diabetes. Within these disorders, issues of renal impairment, impaired liver function tests, the metabolic syndrome, and cognitive impairment demand additional consideration. In addition, safe and ethical inclusion of patients with special characteristics, e.g. the pediatric and adolescent age groups, older subjects, and women of childbearing potential, in early phase studies mandates specific risk management strategies. Access to these patient populations and rapid identification of potential volunteers for trials remain critical factors for successful early drug development. Resnick DB. Research ethics timeline (1932–present). Available from: http://www.niehs.nih.gov/research/resources/bioethics/timeline/. WMA Declaration of Helsinki – ethical principles for medical research involving human subjects. 2014. Available from: http://www.wma.net/en/30publications/10policies/b3/. Accessed 10 June 2014. Belmont report: ethical principles and guidelines for the protection of human subjects of research, report of the National Commission for the Protection of Human Subjects of Biomedical and Behavioral Research. Available from: http://www.hhs.gov/ohrp/humansubjects/guidance/belmont.html. International conference on harmonisation of technical requirements for registration of pharmaceuticals for human use. Available from: http://www.ich.org/fileadmin/Public_Web_Site/ICH_Products/Guidelines/Efficacy/E2F/Step4/E2F_Step_4.pdf. American Medical Association. Available from: http://www.ama-assn.org/ama/pub/news/news/2013/2013-06-18-new-ama-policies-annual-meeting.page. Food and Drug Administration. Guidance for industry. Diabetes mellitus: developing drugs and therapeutic biologics for treatment and prevention. 2008. http://www.fda.gov/downloads/Drugs/Guidances/ucm071624.pdf. Accessed 1 June 2014. Guidance for industry. E14 clinical evaluation of QT/QTc interval prolongation and proarrhythmic potential for non-antiarrhythmic drugs. Available from: http://www.fda.gov/downloads/Drugs/GuidanceComplianceRegulatoryInformation/Guidances/ucm073153.pdf. Guidance for industry. Diabetes mellitus—evaluating cardiovascular risk in new antidiabetic therapies to treat type 2 diabetes. Available from: http://www.fda.gov/downloads/Drugs/GuidanceComplianceRegulatoryInformation/Guidances/UCM071627.pdfeutm_term=guidance. Guideline on clinical investigation of medicinal products in the treatment or prevention of diabetes mellitus. Available from: http://www.ema.europa.eu/docs/en_GB/document_library/Scientific_guideline/2012/06/WC500129256.pdf. Food and Drug Administration. Guidance for industry drug-induced liver injury: premarketing clinical evaluation. 2009. Available from: http://www.fda.gov/downloads/Drugs/…/Guidances/UCM174090.pdf. Food and Drug Administration. Drug development and drug interactions. Updated 2011. Available from: http://www.fda.gov/Drugs/DevelopmentApprovalProcess/DevelopmentResources/DrugInteractionsLabeling/ucm080499.htm. Accessed 8 June 2014. Food and Drug Administration. Drug development and drug interactions: table of substrates, inhibitors and inducers. Available from: http://www.fda.gov/Drugs/DevelopmentApprovalProcess/DevelopmentResources/DrugInteractionsLabeling/ucm093664.htm. Accessed 30 May 2014.